The goal of the program is to restore your health with medical assistance in a patient-friendly setting and to make sure the protocol is well understood to be able to properly follow it once back home. The setting of the program will allow you to rest in a natural thermal spa, meet new people starting the same diet therapy and get all the medical support you need in the first rehabilitation phase. ”My recovery” program is for all those patients with health conditions that require close supervision or an inpatient setting while introducing the new diet therapy. It is also suitable for those people who want to start the diet therapy in the correct way from the very beginning or those who are already on the diet and want to learn more about it. We first analyze your medical records and make sure that your diagnosis is correct to be able to create a precise recovery plan for your case. In severe diseases we help you to decide among different therapeutic options (for example: surgery, chemotherapy, biological therapy) and follow-up diagnostics to keep the disease under control. It is important to be aware that your current medication may be hindering the recovery. Participating in the program will ensure a close follow-up in the first days of the diet therapy. You will receive daily consultations to discuss your condition, ask questions, learn kitchen techniques, recipes and the basics of a lifestyle that will ensure your recovery and long term health. What is the essence of this treatment method? 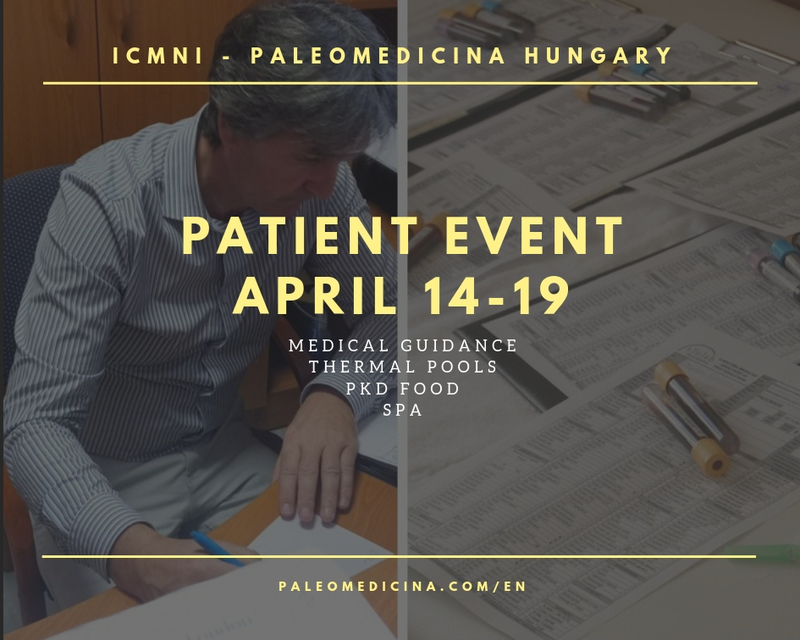 ICMNI treatment method is based on the paleolithic ketogenic diet (PKD), which is a nutritional therapy created by our medical team, based on clinical evidence and clinical experience with thousands of patients. Although the roots of this method can be found in the scientific literature, currently there are no other medical groups using this therapy or having clinical experience in its use to treat chronic diseases. ICMNI’s work and results have been published in international medical journals and presented at medical conferences. We have to specify that the method we use is scientifically based and that we do not use any naturopathy or alternative medicine methods. We do not sell snake oils or practice unscientific methods. What is the difference between the ”My recovery” program and the standard health care? Experience tells us that if you follow the conventional health care system, you won’t get much results as they only preserve diseases. If you choose a private health care service you may encounter better conditions but the effectivity of the treatment will be as low as in the conventional health care because they both use the same standard methodology. We offer much more. In our program, patients can achieve full recovery in most of the cases. Typically, we can observe the first positive changes happening during the program and in some cases, even a full recovery has been achieved. We do not rely on the use of drugs or device-based interventions, therefore our method - if well accomplished - is associated with no risks. In addition to an efficient treatment, we ensure a friendly environment and a high-level hotel service and spa that will make your stay more pleasant. What is our admission policy? We cannot accept applications from patients having acute conditions that may require immediate exploration or intervention such as hospitalization, surgery, or emergency care. We also cannot accept patients without a complete or up-to-date medical records. Whether the medical documentation is complete or up-to-date is at the discretion of our physicians. What do I have to do if I would like to join the program? You have to send your scanned medical documents, a list of the medicines and supplements you are taking, your current weight/height and the actual diet you are following to our email address: paleomedicina@gmail.com. If you need a new laboratory blood work done, we will send you the list of parameters needed and you may have to ask your GP or have it done privately. We are ready to assist you in choosing the necessary diagnostic tests or organize them in Hungary before the start of the program. Can I join the program with a family member or a friend? Yes. If someone would like to accompany you and is not interested in participating to the full program, he/she will only have to pay for accommodation and board (77 EUR/day). Please, indicate whether or not the accompanying person will be eating PKD meals. If not, we would appreciate if she/he could eat at a different time in order to only have paleolithic ketogenic dishes at the patients’ table. Two delicious paleolithic ketogenic meals will be provided every day: breakfast and dinner. There will be two daily check-ups and measurements (blood glucose, ketones, blood pressure and weight) a day. In the case of diabetic patients, there may be more than two measurements daily. There will be individual consultations for medical issues and group consultations for diet education where you can learn kitchen techniques and new recipes. ECG, ultrasound and blood work* will be performed in those patients who need such diagnostics. Outside the daily program, you can enjoy the spa or can do small excursions during the day. If you plan to stay away from the facilities for more than 3 hours, please let us know in advance. What are the local attractions worth to visit? Yes. In case of children, we will need a consent signed by both parents to enter the program. What kind of meals do we serve in the program? All meals are simple, nutritious and satiating. We guarantee high quality paleolithic ketogenic dishes prepared with local pasture raised pork and eggs, grass-fed beef and offal, cured meats without additives such as nitrates and nitrites. In addition, all meals are prepared with care and contain the perfect fat to protein ratio. What to expect after the inpatient stay? After the stay, you will receive a close follow-up if needed. During the follow-up period, we first monitor the patient weekly, then once every second week and then once a month either in person or via e-mail or skype. How can I inquire more about ”My recovery” program? Concrete questions regarding your specific case can only be answered after having seen your medical records. When applying for the program we will ask you to send us your medical records in advance. In case of not receiving the records, we will not be able to provide any detailed information. The cost of ”My recovery” program is 255 EUR/day. It includes medical service, hotel service, access to the spa and all the paleolithic ketogenic meals. Whether the expenses of the program are refundable or not by your private health insurance, depends on the kind of contract you have with them. A non-refundable advance deposit of 110 EUR is required to book your space.